Billionaire Elon Musk's company SpaceX has announced who its first private passenger will be aboard a flight into space and around the moon. Musk welcomed Japanese entrepreneur Yusaku Maezawa to the stage at an unveiling ceremony at the company's headquarters in Hawthorne, California Monday. Maezawa is a 42-year-old Japanese billionaire best known for founding Start Today in 1998 and launching the online fashion retail website ZOZO in 2004. Maezawa will hitch a ride on the SpaceX BFR as the company's, and the world's, first private spaceflight passenger. 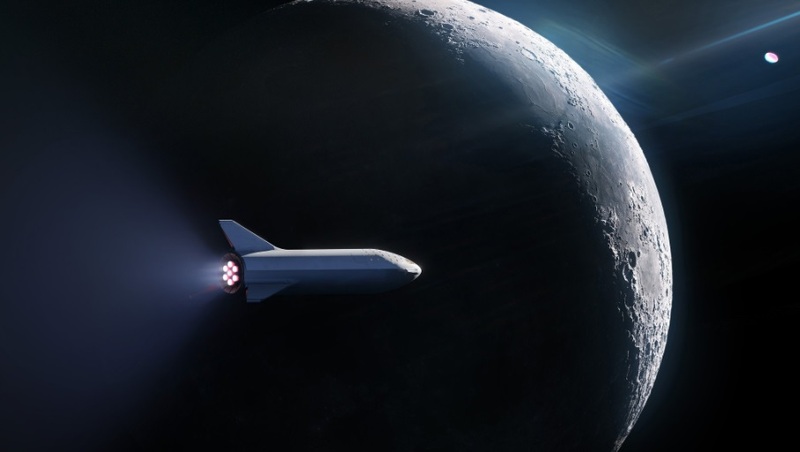 The weeklong journey around the moon in the SpaceX BFR is scheduled for 2023. Maezawa plans to take six to eight artists with him to help capture the inspiration of space. "For me, this project is very meaningful," the entrepreneur said Monday night during the announcement. Musk has been known for his theatrics and the reveal seems like par for the course for the billionaire genius. In February, Musk launched a cherry-red Tesla Roadster into space just for fun and often talks about his vision for colonizing Mars. This isn't the first time he has announced a private moon tourism trip though, he once announced a moon tourism trip with passengers that were never identified and the rocket that he was planning on using is now no longer going to carry people. While he may have grand visions, he is certainly earned a reputation for meeting expectations too. Musk has launched 63 rockets and recovered 29 of the first-stage rocket boosters. Fifteen of those boosters would go on to be flown again. He recently appeared on the JRE Podcast and spoke of his future plans to colonize the red planet. He also took a hit of some weed on the show which was instantly immortalized in the form of dozens of memes. SpaceX's BFR stands for Big Falcon Rocket which has been chosen for the moon trip. It will mark the first time humans will have returned to that part of space since the final Apollo mission in 1972 although a launch date has not been announced. Yusaku Maezawa is the founder of eCommerce site ZOZO which has a unique technological approach to online shopping. Customers of ZOZO receive a special body suit that uses the company's app to take precise measurements which can then be uploaded online to make sure your orders are the perfect fit. Maezawa says his reason for renting the BFR is simple, he has had a passion for the moon for a long time and has noticed others have been inspired by it as well. He referred to Vincent van Gogh's Starry Night, the Beatles' Mr. Moonlight, as well as various other art that is known to have been inspired by the moon. Maezawa plan to bring artists to space isn't exactly a new one. Scott Hubbard, adjunct professor in Stanford University's Department of Aeronautics and Astronautics and former director of NASA's Ames Research Center, said that NASA has talked about sending people into space who can ponder on human meaning from a heightened perspective. "The idea has been floating around for decades," Hubbard said. SpaceX's BFR is a vehicle that the company is still building and has yet to undergo a single test flight. That didn't stop Maezawa from renting out the BFR for his week-long voyage in 2023. The BFR is expected to be more powerful than the Saturn V rocket that took NASA astronauts to the moon. The BFR will even dwarf the SpaceX Falcon Heavy that drew attention in early 2018 for being the world's most powerful rocket. Hubbard says that will that large of a rock comes engineering challenges. "Building any new rocket is a major challenge," he said. "Historically, new rockets have had a high failure rate." The BFR will use a launch vehicle system that has both a first-stage rocket booster that is used for getting away from Earth's gravity and an upper-stage rocket for propelling the rocket toward its destination once in orbit. The two components will stand an eye-opening 387 feet tall which is bigger than a football field. The BFR will be powered by its Raptor engine which has already begun testing in McGregor, Texas, the site of the test facility where every SpaceX engine undergoes testing. Musk's SpaceX also has plans for building a launch facility on the Gulf Coast near Brownsville which could serve as a potential launch zone for the BFR. A space market analyst for Forecast International named Bill Ostrove has doubts about whether Musk will actually launch Maezawa on a trip to the moon. Ostrove pointed out that Musk has a tendency of announcing grand plans that don't always grow into fruition, the first private moon flight Musk previously announced being a perfect example. "Though with that being said, SpaceX has had a lot of success in achieving their goals," Ostrove said, "so I think they will eventually." Earlier this year, President Donald Trump directed NASA to return astronauts to the moon and Vice President Mike Pence revealed plans to do just that a NASA ceremony. As to who will be the first to return to the moon, NASA or SpaceX, remains to be seen.